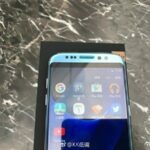 Update: The images are fake and are of a Chinese clone Galaxy S8. 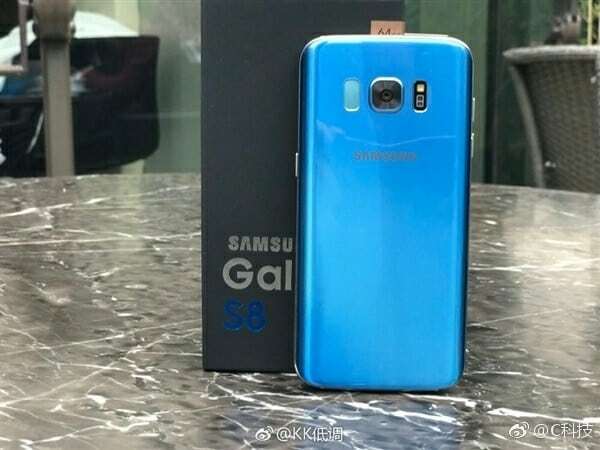 As we have told you several times that Samsung is going to launch its new flagship devices in the Galaxy S series known as Galaxy S8 and Galaxy S8 Plus and we have already seen a number of leaks for both the devices and we also seen leaked images from both the devices. 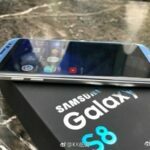 Now some more images from the smaller Galaxy S8 smartphone have been leaked that comes with the Galaxy S8 retail box as well with the "Samsung Galaxy S8" name written clearly on it. 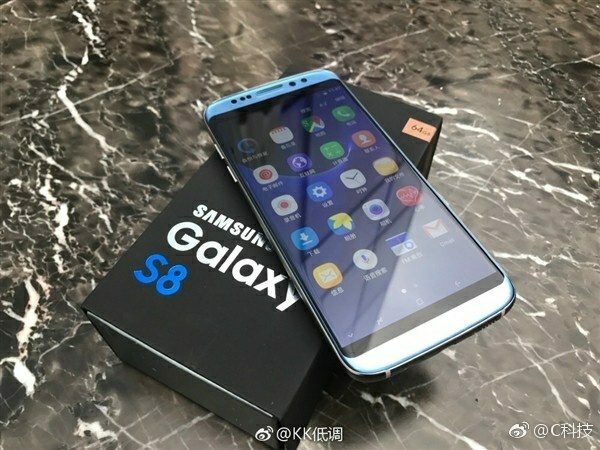 The images are posted by a weibo user but we don't know if these are real images or are edited but the Galaxy S8 in the images looks exactly same like we saw in its past rumors and image leaks. 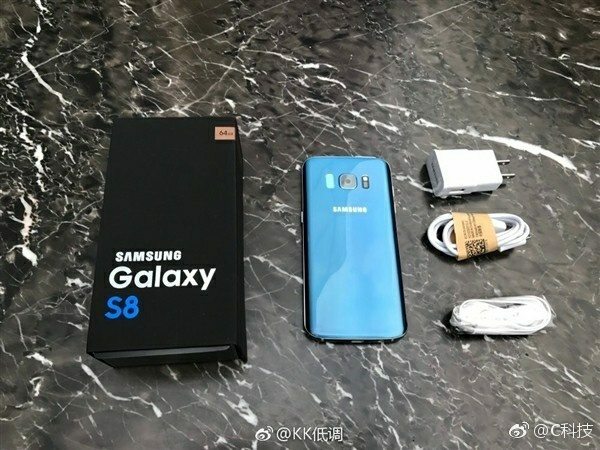 So these might be the real Galaxy S8 leaked images with the original retail box. 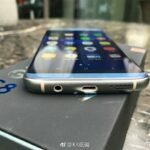 The device that is leaked in the leaked images comes with Blue Coral color option and shows the device from all angles. As we have seen in the past, there is no front fingerprint scanner available and a couple of sensors are at the top along with the Iris scanner and the front facing camera. The back panel comes with glass finish and we have a fingerprint scanner on the left and the camera lens in center followed by the dual tone LED flash and heart rate sensor as well. It comes with 3.5mm. headphone jack at bottom panel with USB type-C port and the speaker grill on the bottom right. 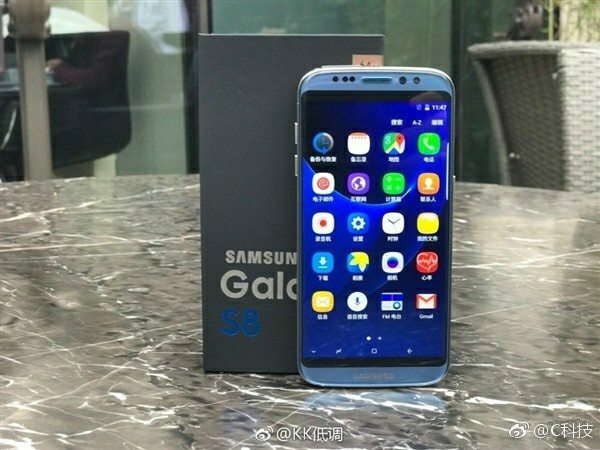 Samsung Galaxy S8 has recently got the 3C approval in China and has already got the FCC approval for a number of variants. According to the past rumors, the Galaxy S8 is expected to feature a 5.8-inch Quad HD+ curved Super AMOLED display with pressure sensitive feature along with 2560×1440 pixels resolution. It will be powered by the Qualcomm Snapdragon 835 or an octa-core Samsung Exynos 9 Series 8895 processor. It will have 4GB of RAM with 64GB internal storage capacity with MicroSD card expandable storage. It will run on the Android 7.0 (Nougat) OS and will come with Dual-SIM support that might be Hybrid. A 12-megapixel Dual Pixel rear camera is expected to be available with LED flash and f/1.7 aperture along with an 8-megapixel front-facing camera with f/1.7 aperture. 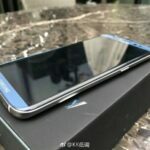 It will feature a 3000mAh battery with fast Charging via wired and wireless (WPC and PMA) charging options and we will have 4G VoLTE, Wi-Fi 802.11ac, Bluetooth 4.2 LE, GPS with GLONASS, USB 2.0 and NFC connectivity options. A 3.5mm headphone jack is expected and there will be a heart rate sensor, fingerprint sensor available on the rear side with Iris scanner and Barometer. The Galaxy S8 will be IP68 verified with water and dust resistance feature. 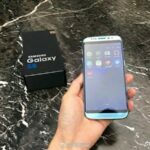 The Galaxy S8 Plus will feature a 6.2-inch Quad HD+ curved Super AMOLED pressure sensitive display with 2560×1440 pixels resolution and will be powered by a Qualcomm Snapdragon 835 or Octa-Core Samsung Exynos 9 Series 8895 processor. It will also feature the same 12-megapixel Dual Pixel rear camera with LED flash and f/1.7 aperture. There will be an 8-megapixel front-facing camera to be available on front with f/1.7 aperture. A 3500mAh battery with fast Charging will power the device via wired and wireless (WPC and PMA) charging options. It will have 4GB of RAM and 64GB internal storage that will be expandable via MicroSD card. It runs on the Android 7.0 (Nougat) OS out of the box with Dual-SIM support. Connectivity options expected are 4G VoLTE, Wi-Fi 802.11ac, Bluetooth 4.2 LE, GPS with GLONASS, USB 2.0 and NFC with a 3.5mm headphone jack. It will also have heart rate sensor, fingerprint sensor, Iris scanner and Barometer. The Galaxy S8 will be IP68 verified with water and dust resistance feature.